This is real beauty of App from Samsung for Android devices. Mind you, you will need a Samsung device with stylus to use it. This new App launched today by Samsung is called Pen.up. 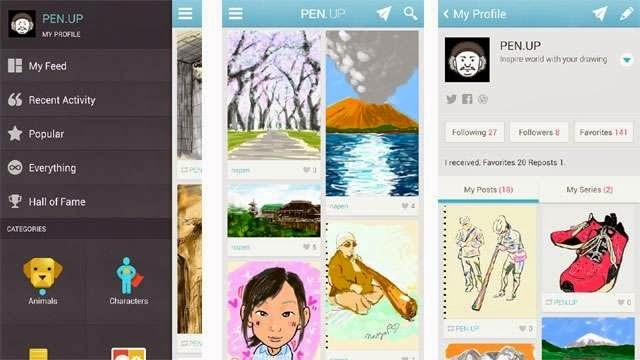 It is a doodling App and a social networking App combined into one. Once you download the App, you can used your S-Pen or the Samsung stylus to create art as you see it on your smart phones and tablets. The Pen.up works beautifully on the Samsung's large screened smart phones. You can create and set up your own images or follow friends and fellow S-Pen doodlers on the Pen.up. Pen.up will give you a feed consisting of creative images from people you follow much like the Facebook. It also has a feature called Series which lets you and your friends add their own creations to a collective folder. Like you may want to build up on a doodle by your friends and create a sequel to the doodle. This can go on and on with the Series feature. Pen.Up also has a section that displays artists and artworks called Popular which, you probably guessed, will be the most liked creations. To further make your search easier for find the best creations on the network, the Pen.up also has “best of the best” feature will display only the best of artworks and artists. You can vie for the place in the best of the best by competing for a spot to the Hall of Fame. As said above the App works really great with Samsung Galaxy Note 2 which comes with a S-Pen. Samsung will ship preloaded Samsung Galaxy 3 with Pen.up. If you are a doodler or a aspiring amateur, head over to Google Play to download Pen.Up.